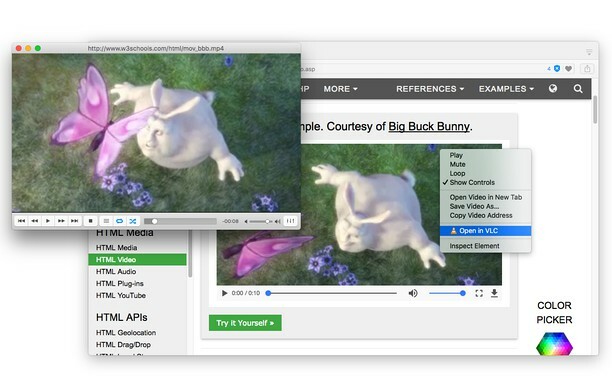 Open in VLC media player add-on, opens stream-able video and audio links in VLC media player. This way you can watch online-streams in the well-known VLC media player. To send stream-able URL to VLC media player, right-click over the video or audio link. If you have found a link that is not yet supported, please open a bug report in the discussion section of add-on's FAQs page. Note: For this extension to work, you will need to install a minimal native-client application. Instruction on how to install the native client will be displayed once context-menu item is clicked. You can also watch installation instruction in the YouTube tutorials inside the "Screenshots" section of this page. 2. The toolbar icon becomes available when a page is supported. For instance if a full-page player is loaded, as of version 0.1.2, the toolbar button should appear. To test open http://www.w3schools.com/html/mov_bbb.mp4 in a browser tab. You will notice the toolbar icon is now orange and clickable.